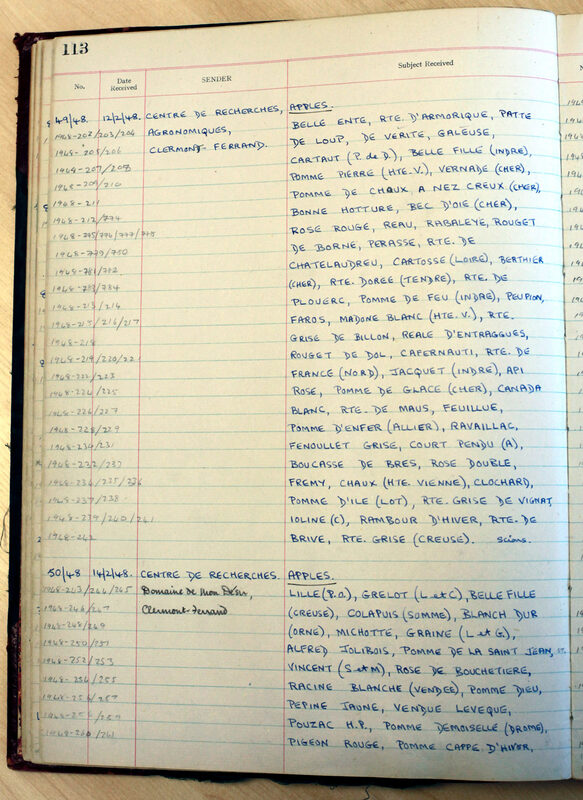 Carefully recorded information about the origins of the fruit varieties conserved in the British National Fruit Collection should help their French counterpart adjust their own records. The first aim of my 26 June 2018 visit to Brogdale in Kent was to research the public archives of the British National Fruit Collection (NFC)1. I knew from my previous visit in 2017 what sort of information I could find here. A conversation with my colleagues of the French association Les Croqueurs de Pommes2 this spring led us to conclude that some of this information might help fix a few variety identification mistakes that were uncovered during recent genetic tracing in the French national fruit collection. I offered to collect the information during my next visit to the NFC. The Croqueurs de Pommes would then pass it on to INRA3, the Institut National de Recherches Agronomiques, the public institution which curates the French collection. This would contribute to the long-established collaboration between countries to create and manage national fruit collections; a collaboration which enables them to develop a common horticultural heritage for the benefit of current and future generations. The horticultural curator of the NFC took me through the collection’s archives when I visited Brogdale in July 2017. This is how I started to find out how France and the United Kingdom, as well as other countries, supported each other in developing their fruit collections. This would be later confirmed by conversations I had in France and Europe; I found evidence of this happening on a regular basis for a very long time. For instance, INRA sent graft wood of fruit varieties growing on French soil after World War II to help the NFC make their collection more representative of the diversity of apples, pears and other fruit cultivated in temperate climates. Later on, the NFC helped INRA recover some of these varieties after disease (in particular fire blight) destroyed part of the French national collection based in Angers. During my 2017 visit, I choose to focus on one particular variety to understand where to find the trees in the NFC and what information was available in the archives. I was pleased to use the Reinette de Maurs as a case study. This apple is a local variety named after a village of 2,000 inhabitants located thirty miles away from my hometown in France. 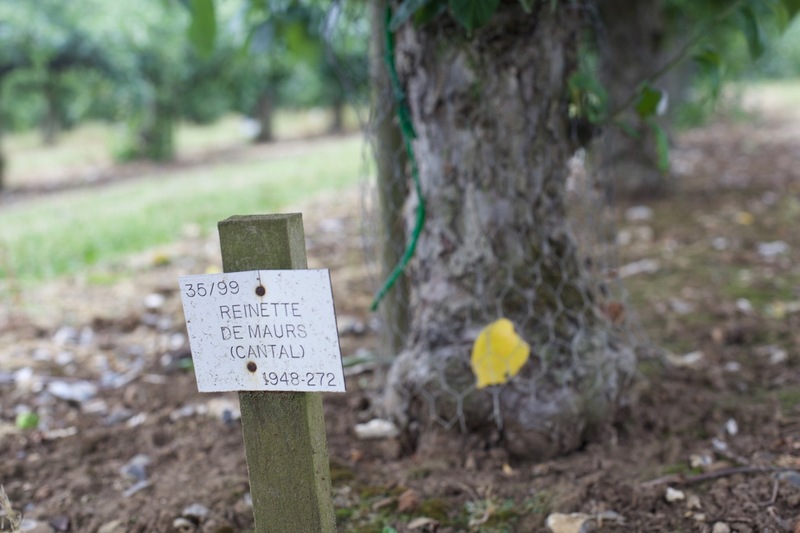 Graft wood of the ‘Reinette de Maurs’ variety grown in Cantal4, France, was sent to the British National Fruit Trials in 1947 and the variety added to the collection in 1948. Photo 3 July 2017, Brogdale, Kent, United Kingdom. The variety has been present in the NFC since. Same tree pictured from a different angle. The conic shape of the fruits is typical of the ‘Reinette de Maurs’ variety5, an excellent dessert apple. On 26 June 2018, I arrived at Brogdale around 10am after a two-hour road trip from the South Coast of the United Kingdom. The horticultural curator I had met in 2017 welcomed me and took me to the archives room. I selected the registers where I knew I would find the information I was looking for and was invited to sit at a desk where I had enough light to take pictures of the pages I was interested in. Two hours later, my research was complete. A week later, I collated the information for it to be easily searchable and I sent it to France. Page 113 of the first NFC Acquisition Book. 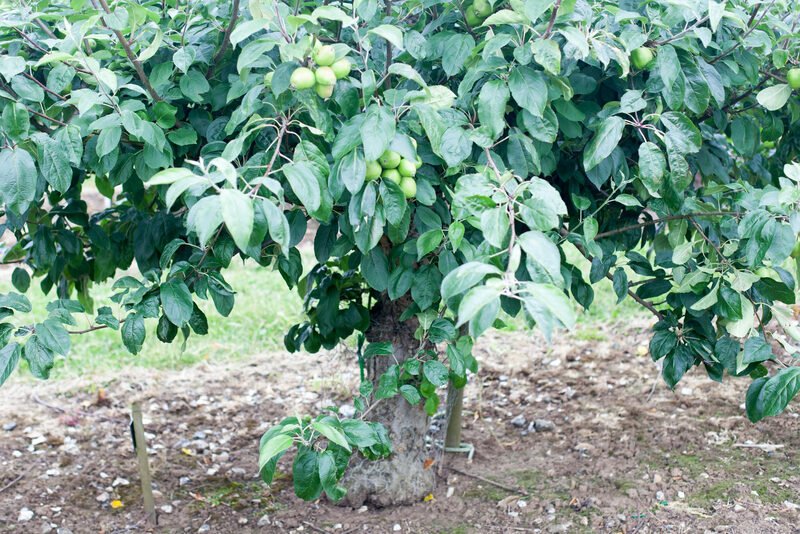 On 12 February 1948, fourty apple varieties were registered, sent by the INRA research centre based in Clermont-Ferrand, France. Photo 26 June 2018, Brogdale. 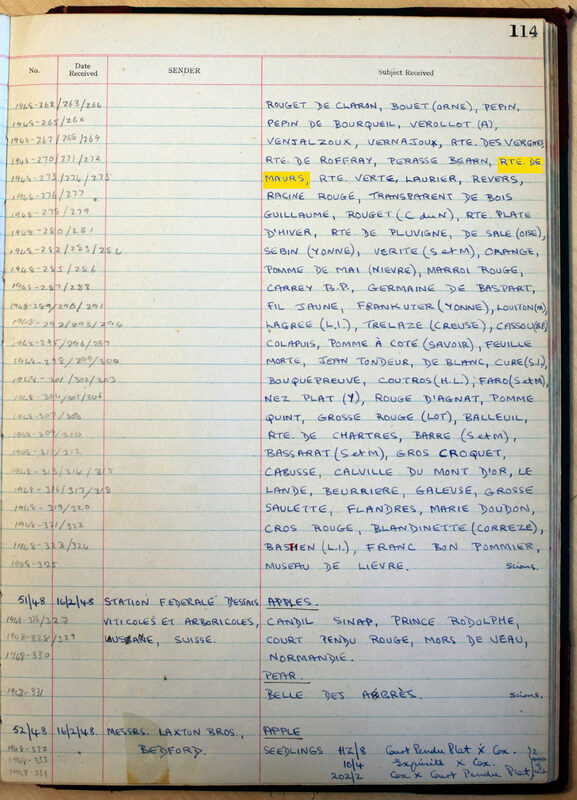 Eighty-three other apple varieties coming from the same research centre were registered on 14 February, including the ‘Reinette de Maurs’ mentioned above. The recipient, a member of the Croqueurs de Pommes I am in regular contact with for pomology and other matters, thanked me cheerfully. He said my action would ‘improve knowledge of graft wood journeys throughout history’ and result in a ‘better grasp of the multiple origins of the French varieties (available in the French national fruit collection) which will probably enable to understand the current identification mistakes’. I was pleased to make a small contribution towards an effective conservation of heritage fruit varieties, which will inform horticultural research and hopefully highlight the potential of biodiversity in fruit production. This entry was posted in Fruit for sustainable development and tagged Apples, CroqueursDePommes, Pears, UK by Les Jardins d'ici. Bookmark the permalink. Excellent work! Fruit germplasm collections are so important. Having as much information as possible about the collection increases its value. Super Jean Jacques, c’est Très intéressant tout ça, Bravo pour tes recherches…!